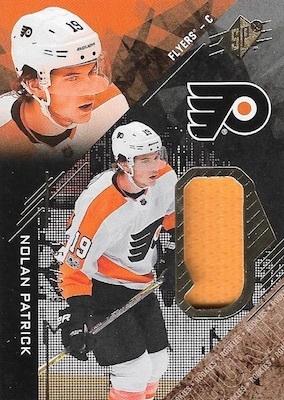 Since it continues the one-card-per-pack format of last year, 2017-18 SPx Hockey is less likely to be shocking, but that doesn't mean there aren't any changes. 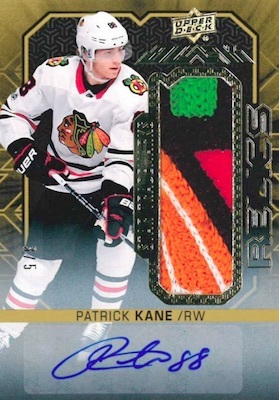 The NHL release again includes at least one autograph and one relic in each four-card box. 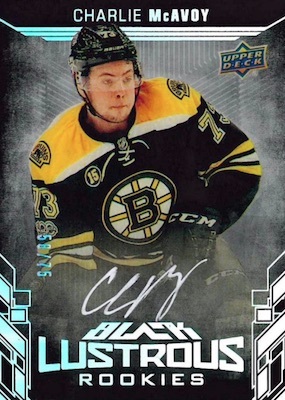 In addition to the expected lines under the SPx brand, this year also sees the inclusion of Upper Deck Black in 2017-18 SPx Hockey. 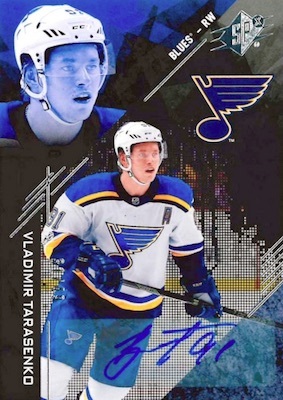 This was not the case in 2016-17 SPx, as UD Black had its own standalone set. 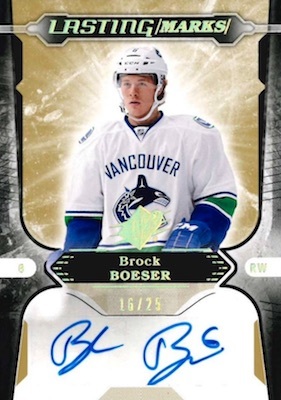 Featuring only cards with 80-point stock or higher, the 2017-18 SPx Hockey checklist offers Base Stars (#/249), Base Legends (#/249), and Base Rookies (#/399). Each includes a Spectrum parallel. 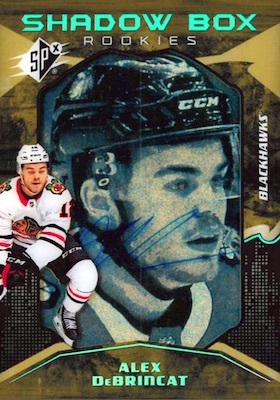 Adding signatures to the 2017-18 SPx Hockey lineup, the Shadow Box Rookies Autograph (#/148 or #/98) set features Gold Spectrum parallels that are limited to either 18 or eight copies. There are also Rookie Autographs (#/199 or #/99) and Rookies Gold Premium Material Autographs (#/49 or #/25). Current and former NHL players join in through Legends Autographs (#/15) and Stars Autographs (#/149, #/49 or #/15). Auto relics enter the mix, as well, with Stars Gold Premium Material Autographs (#/49, #/25 or #/10) and Legends Gold Premium Material Autographs (#/10). The Rookies, Stars, and Legends auto relics each add a White version, numbered to only five copies. 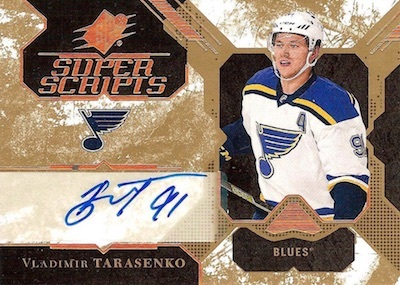 Other signed inserts in the 2017-18 SPx Hockey checklist include Impressions Autographs (#/249, #/125 or #/25), Lasting Marks Autographs (#/25), and Superscripts Autographs (1:20 packs). 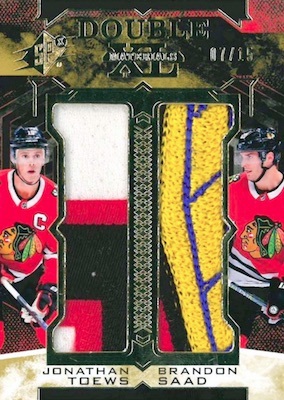 Likewise, the 2017-18 SPx Hockey memorabilia cards follow a similar pattern with Rookie Material (#/299), Stars Material (1:18 packs), and Legends Material (1:240 packs). These each have Premium parallels numbered to 25 or less. 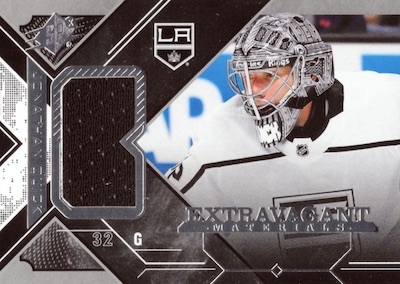 In addition, there are Extravagant Materials (1:20 packs) cards, and Double XL Duos Materials (#/199 or #/99), which matches two oversized player relics on the same card. 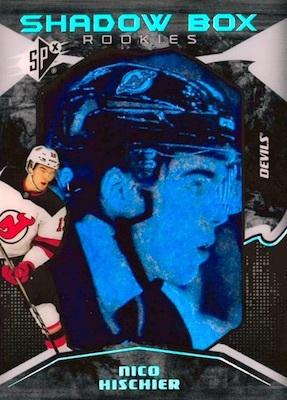 However, that's not all as 2017-18 SPx Hockey rolls Upper Deck Black cards into the equation. 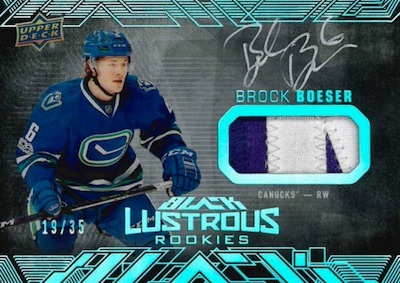 UD Black Lustrous Rookies can be found in base (#/299), Jersey (1:20 packs), Patch (#/35), Autograph (#'d), and Auto Patch (#/65 or #/35) editions. 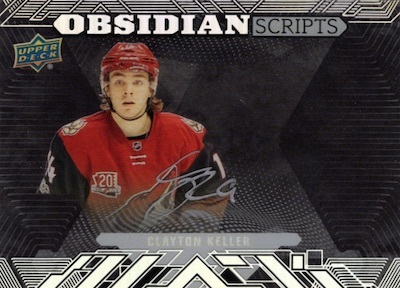 Also presenting multiple choices, UD Black Obsidian Scripts (1:80 packs) covers Rookies (1:460), plus numbered Material Scripts. 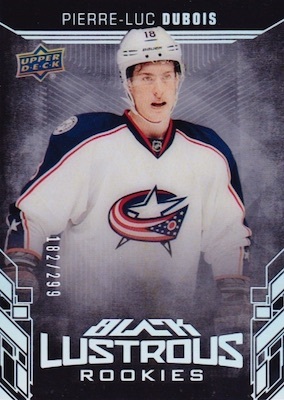 Finally, there are UD Black Trademarks for Star players (#/199) and Rookies (#/299), including Auto Patch parallels. 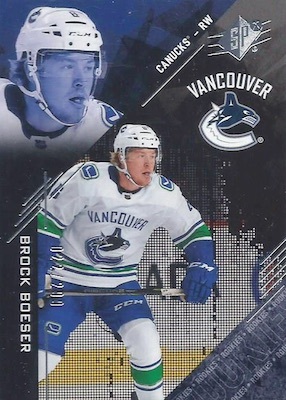 Shop 2017-18 SPx NHL cards on eBay. 25 cards. Serial numbered #/298. PARALLEL CARDS: Gold #/18 (#26-43) or #/8 (#44-50). Overall odds: Stars - 1:18 Hobby/ePack; Legends - 1:240 Hobby/ePack. 25 cards. Serial numbered #/299. 23 cards. Serial numbered #/299. PARALLEL CARDS: White Auto Tag #/5. PARALLEL CARDS: Black Premium #/15 or #/10*. Overall odds - 1:20 Hobby/ePack. 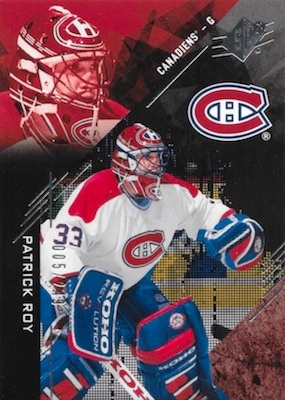 PARALLEL CARDS: Onyx Patch #/35 (No Tuch*). 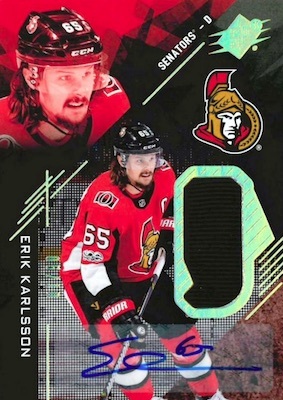 Overall odds - 1:80 Hobby/ePack. PARALLEL CARDS: Onyx #/25, Gold Spectrum #/5. Overall odds - 1:460 Hobby/ePack. PARALLEL CARDS: Onyx #/35, Gold Spectrum #/10. 5 cards. Serial numbered #/49. PARALLEL CARDS: Onyx Patch #/35, Gold Spectrum Tag #/3. 15 cards. Serial numbered #/40. View the 2017-18 SPx Hockey checklist spreadsheet. With only a single Predators card on the entire checklist, I guess I’ll be saving a lot of money that would have gone to breaks. Thanks Upper Deck! Man, I miss Panini. UD is an increasingly unfunny joke. I was actually pleasantly surprised with my box. I got one Shadow box card, which is all I really wanted. I got two cards from UD black and then an SPx jersey card. SPx Jersey card was nothing to write home about but, for the $80 I spent I walked away happy with my four cards. Also, unlike trilogy I was happy to see semi low numbers on the cards rather than my “big hits” being numbered to 999. I would gladly buy a second a box of the product. Bought a pack for $25 plus tax and ended up with a Kopitar base card /299. I know it’s a gamble but wow I got robbed. Never again on anything high end UD! Lesson learned! Awful product. Why is Ryan Johansen and Dave Schultz in every product lately ? Was in a few breaks. WAY too many patch cards of veterans that have no resale or collecting value. Have to hope to hit on a rookie. The design is breath-taking especially for UD Black, and those Obsidian parallels, oh my God… The Shadow Boxes are very nice and contrary to the last year, they reduced their thickness to 180 pts. I love the idea of incorporating UD Black into this set, and not as its own collection. Now, the problem is that the rookie crop this season is meah…Of course this is not the fault of Upper Deck. Their problem is the diminished checklist with so many missing stars. They chose to go with an active players/old stars combo, but honestly, there are many old stars there that don’t interest many collectors anymore. This is a mid-to-high-end (I believe) and when you get 4 cards per box you should only have the top of the top. I’m sorry, but Pominville and Chychrun (no offense guys!) do not pertain to this category. 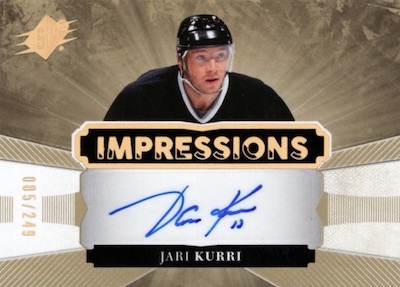 Also, the 3 auto subsets, Super Scripts, Lasting Marks and Impressions, are very similar. No originality there. All in all, I would have granted 3 stars if the checklist was better. For the dollar value, you’re better off ripping these little 4 card boxes yourself than gambling on a group break….still needs more Vegas!! I love the cards, hate the fact that you have to get “Lucky”. With only 4 cards a box and boxes at $90.00+, you better hit something or it is depressing. Participated in 6 or 7 breaks and have seen an example of almost every configuration. Black Obsidian, Lustrous RC, and Shadowbox cards are top notch. Have seen a lot of damaged cards coming from brand new packs/boxes/cases. 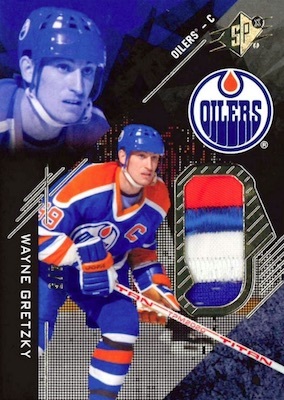 Truly an unfortunate product from Upper Deck. For over $100, I received one player worn jersey card and one low tier rookie auto. The other two cards were essentially base cards. 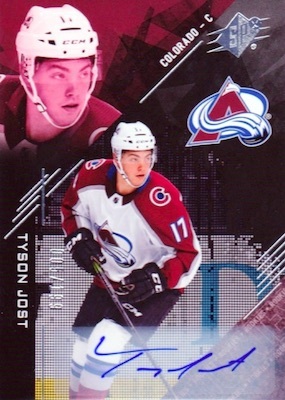 I am usually an advocate for Upper Deck and their hockey products, even when I strike out like in this case. However, I truly feel that this is not the greatest look for the brand nor the best buy for the consumer.